You want to see or directly in the market activity of the river by boat. This floating market in Banjarmasin is located precisely at the intersection of River Kuin and Barito river. 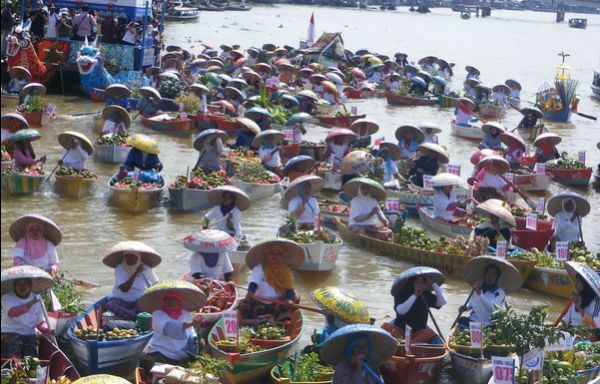 Floating market in Banjarmasin is a reflection of the Banjar culture that has lasted since the first. In South Kalimantan, there are hundreds of rivers became an important transportation route until now. Visitor attractions also relies on the river, such as Muara Kuin floating market in Banjarmasin this. When the sun rises visit this market which reflect light in the morning between transaction vegetables and crops from the villages along the Barito river and its tributaries. Muara Kuin Floating Market is a traditional floating market is located on the river at the mouth of the Barito river Kuin, Banjarmasin, South Kalimantan. The merchants and buyers to use boats, boats in a language called Banjar. This market began after the dawn prayer until after 9 am. The specialty in this market is still frequent barter transactions between the traders boating is in a language called Banjar bapanduk. Women traders (hamlet) which boating sell their products themselves, while a second hand purchase from the hamlet for resale called panyambangan. Banjarmasin as the capital of the province is a center for trade and tourism. Banjarmasin city earned the nickname City Water because the location of the land a few inches meters below sea level. Banjarmasin city, has an area of ​​72 square km or about 0.22 percent area of ​​South Kalimantan. The city is split by the river Martapura provide its own characteristics on the lives of its people especially the use of rivers as a means of water transportation, commerce and tourism. Besides Muara Kuin floating market in Banjarmasin, other floating market you can find are in the Lok Baintan which is above the Martapura River.